The dimension of power is energy divided by time. The SI unit of power is the watt (W), which is equal to one joule per second. Other units of power include ergs per second (erg/s), horsepower (hp), metric horsepower (Pferdestärke (PS) or cheval vapeur (CV)), and foot-pounds per minute. One horsepower is equivalent to 33,000 foot-pounds per minute, or the power required to lift 550 pounds by one foot in one second, and is equivalent to about 746 watts. Other units include dBm, a logarithmic measure relative to a reference of 1 milliwatt; food calories per hour (often referred to as kilocalories per hour); BTU per hour (BTU/h); and tons of refrigeration (12,000 BTU/h). In fact, this is valid for any force, as a consequence of applying the fundamental theorem of calculus. It is the average amount of work done or energy converted per unit of time. The average power is often simply called "power" when the context makes it clear. The instantaneous power is then the limiting value of the average power as the time interval Δt approaches zero. In the context of energy conversion, it is more customary to use the symbol E rather than W.
One metric horsepower is needed to lift 75 kilograms by 1 meter in 1 second. Power in mechanical systems is the combination of forces and movement. In particular, power is the product of a force on an object and the object's velocity, or the product of a torque on a shaft and the shaft's angular velocity. where x defines the path C and v is the velocity along this path. where A and B are the beginning and end of the path along which the work was done. where p is pressure in pascals, or N/m2 and Q is volumetric flow rate in m3/s in SI units. If a mechanical system has no losses, then the input power must equal the output power. This provides a simple formula for the mechanical advantage of the system. These relations are important because they define the maximum performance of a device in terms of velocity ratios determined by its physical dimensions. See for example gear ratios. is the resistance, measured in ohms. In a train of identical pulses, the instantaneous power is a periodic function of time. The ratio of the pulse duration to the period is equal to the ratio of the average power to the peak power. It is also called the duty cycle (see text for definitions). are equal. 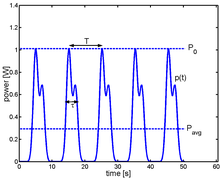 These ratios are called the duty cycle of the pulse train. Power gain — for linear, two-port networks. ^ Burning coal produces around 15-30 megajoules per kilogram, while detonating TNT produces about 4.7 megajoules per kilogram. For the coal value, see Fisher, Juliya (2003). "Energy Density of Coal". The Physics Factbook. Retrieved 30 May 2011. For the TNT value, see the article TNT equivalent. Neither value includes the weight of oxygen from the air used during combustion.